6 drawings on paper, laminated (1 sheet) : ink ; 9.5 x 6 in. 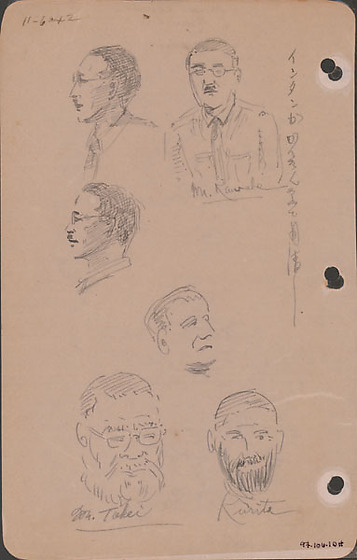 Ink portrait sketches of six men, three identified by inscriptions. Top left sketch of mustached man with sharp nose wearing glasses and a tie in profile facing left. Top right sketch of a mustached man, Mr. Kawabe, wearing glasses and shirt and tie facing the viewer. Middle left sketch of a mustached man's head in profile facing left. Middle center sketch of man's face facing right. Bottom left sketch of a man, Mr. Takei, fully bearded head and wearing glasses looking to the right. Bottom right sketch of a man, Kurita, with dark fullly bearded face. Written in black ink, top left corner: 11-6-42. Written in black ink, vertically on right (In Japanese): Written in black ink on top right image: Mr. Kawabe. Written in black ink, bottom row (left to right): Mr. Takei, Kurita.